Oil demand in the 10 top-consuming Middle Eastern countries (ex-bunkering) posted a rare y/y increase in November 2018, rising by 64 thousand b/d to total 5.96 mb/d, the first y/y gain since December 2017. 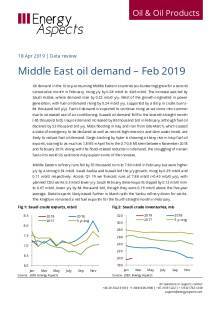 Regional demand rebounded as Saudi Arabian demand declines eased to just 59 thousand b/d y/y, though it was the eighth straight month of y/y contraction in the Kingdom. Saudi crude burn surprisingly gained y/y, by 24 thousand b/d, while fuel oil demand was broadly flat y/y, despite slightly cooler-than-usual weather. Saudi diesel demand posted yet another y/y contraction (-34 thousand b/d). Despite continued substitution towards gas and fuel oil in power generation, Saudi fuel oil demand was lower y/y in the year to November, by 9 thousand b/d, as higher electricity prices curbed power consumption. Iraqi demand continued to impress, growing by 0.13 mb/d y/y, with gains across the barrel, led by fuel oil (+0.14 mb/d y/y). But Kuwaiti demand fell y/y for the fourth straight month, by 35 thousand b/d. Middle Eastern refinery runs fell by 0.1 mb/d m/m to 8.0 mb/d in November, but were higher y/y by 0.4 mb/d. Saudi diesel exports eased in November, but were once again higher y/y, by 0.15 mb/d at 0.78 mb/d. The Kingdom ended a run of six straight months as a net fuel oil importer, with net fuel oil exports at 0.1 mb/d. Meanwhile, the restart of the 0.13 mb/d RFCC at the UAE’s Ruwais 2 refinery has been delayed until February, as the commissioning phase took longer than anticipated. Initially, new supplies may be absorbed within the region, with Saudi Aramco’s 0.24 mb/d Yanbu refinery scheduled for maintenance over March and April before the start of Ramadan on 5 May. That said, Middle Eastern maintenance works appear to be lower y/y in H1 19, with no planned works scheduled in Bahrain, Kuwait and Qatar.